* And at around five-thirty today, I will be on Albany's Soundoff With Sinkoff on WTMM. You can also listen live online by clicking the top button here, or by turning to 104.5 The Team ESPN Radio if you live in the Albany area. * Tomorrow, NOTE RESCHEDULING INFO), in the four o'clock hour, I will be on The Andy and the Amigo Show on Fort Lauderdale's WFTL Sports. You can listen live Tuesday by clicking the 640 button or by switching the dial to 640 AM if you live in South Florida. "Spahn and Sain and pray for rain" dates back to the late 1940s, when the Boston Braves' rotation was fronted by star pitchers Warren Spahn and Johnny Sain. That Braves team made it to the World Series in 1948, where they became the last team to lose a World Series to the Cleveland Indians. At the start of the season, the Met rotation could have been described as "Johan, Pelfrey and Maine and pray for rain." But now it's more like "Redding and Parnell and straight to hell" or, in a nod to Figueroa, Misch and the Mets' financial woes, "Nelson and Pat and pass the hat." I do feel bad for Parnell, who is taking one for the team by struggling as a starter when he seems much better suited to be a reliever. And it's good to see that Redding, Misch and Figueroa have all pitched well recently. But it is not realistic to expect any of them to keep it up. Parnell had that one great start against the Giants and has been miserable ever since. Fernando Nieve tailed off after a great start before getting hurt. Jon Niese alternated good starts and bad starts before he got hurt. It would take a miracle worker to make Figueroa, Misch, Parnell or Redding part of a contending rotation next year. The way things have gone, the same could be true of Mike Pelfrey, John Maine and Oliver Perez. But reports are that a miracle worker could be available this winter. Cardinals' pitching coach Dave Duncan might be leaving St. Louis. Under Duncan, the Cardinals beat the Mets in the 2006 NLCS behind the likes of Jeff Suppan, Jeff Weaver and Braden Looper. By the time Rick Peterson lost his job, few fans complained about replacing the hardwood floor with the Tuscany tile, as Peterson put it at the time. But Peterson helped a lot of pitchers while he was with the Mets, and his methods kept them a lot healthier than they are now. While some circumstances, such as what he has to work with, are beyond Dan Warthen's control, what exactly are the success stories under Warthen? After the season, the Mets need to think about replacing the "Tuscany tile." But if Duncan is available, there will probably be a bidding war over him, so the Mets will have to settle for "Big Pelf and everyone else is on the shelf." Sorry I haven't been squawking much. Between being out of town, and writing for The Faster Times, I haven't had much time as of late. I should be able to get back on a regular squawking schedule this week. I did write a new piece for The Faster Times called Some New Joba Rules for the Yankees. Check it out. And I got to watch most of the games this weekend. The Chicago White Sox looked dead, dead, dead. I don't get why Ken Williams broke the bank last month for this team in picking up Jake Peavy and Alex Rios. And how about A.J. Pierzynski? He continues to be one of the more annoying players in baseball by knocking Sergio Mitre - who was pitching a one-hitter - Saturday with a batted ball. Granted, it was an accident. But A.J. is like the Forrest Gump of mayhem - he always seems to be in the middle of such things. Did you see the way Mark Teixeira's eyes lit up just before his homer Sunday? That was hilarious. Did you see this quote from Ozzie Guillen this weekend? "I’m always going to say the way it is. Some people have some guts, some people don’t, some people say maybe it’s Ozzie being Ozzie, my honesty takes me to a lot of problems, but nobody is going to change me. And I will keep my head up because I know I was telling the truth. I never lied. The only time I lie is when I tell my wife I love her every day. That’s bull (bleep). But everything else, I’m straight up. I think Ozzie's going to be sleeping on the couch for a while after that remark. Sheesh. One of the cool things I did get to do this weekend was to go on New York's 1050 ESPN Radio Friday night. I spoke with Bill Daughtry about my article on why I think Mark Cuban ought to buy the Mets. It was a lot of fun. Thanks to Bill and his producer for putting me on the air. Coming later today - I actually agree with something Kevin Youkilis said! But in the meantime, please tell us what you think of the state of the Yankees! Big News: I'm going to be on NYC radio tonight! I wrote a piece today for The Faster Times about why Mark Cuban should buy the Mets. And I'm going to be on 1050 ESPN Radio tonight at around 10:25 p.m. to talk about it. Bill Daughtry will be interviewing me. If you can't get that station in your area, I think you can listen live online here. Wish me luck! Quick note: Check out my Faster Times piece on how Red Sox GM Theo Epstein admitted that Jonathan Papelbon is "not a Rhodes scholar." The thing is, I actually think Papelbon was right in his concerns about Billy Wagner, so I come to his defense - a little! In other news, Squawker readers and Twitter followers are unanimous - if Kevin Youkilis is Fred "Twinkletoes" Flintstone, then Dustin Pedroia is Barney Rubble! Well, last night kind of stunk. So much for that ninth-inning magic. I'm still peeved about Joe Girardi's dopey move with Nick Swisher. And it isn't second-guessing - I called it at the time. Squawker Jon is my witness! Here's the story: Jon is housesitting in upstate New York- I tagged along for a few days - and we went to dinner last night at New World Home Cooking in Saugerties (it gets two Squawker thumbs up, by the way!) So we heard the first few innings of the game on XM Radio on the way to dinner, then heard the last inning on the way back. And by the way, not to get all cranky on this, but John Sterling is really terrible at painting the picture of what's happening in the game, especially when Suzyn is off getting ready to do her postgame interviews. Because it was hard to figure out exactly what the hits looked like. * Frankie Francisco was on the ropes. It made no sense to give up an out. * Swisher has 21 homers this season. Even if most of them are away homers, there was still the chance he could hit a homer - or at least get a single - to win or tie the game. * There was a very good chance Swisher would mess up the bunt. Which is exactly what happened. * Having him sacrifice made even less sense, given that it was Melky Cabrera coming up after him. I know the Melkman has delivered with three walkoff hits this year, but c'mon. Anyhow, I was not a happy Squawker after Swisher popped up, and Melky hit into a double play. But for Squawker Jon, he had a moment of joy after yet another miserable day in Metland. It's only one game, and the Yanks still have a six-game lead. But they should have won it. However, things could be worse. I could be a Met fan! As for Joba, I think it's time to, as Bill Parcells would say, take the Huggies off. Enough of these long rests in between starts. I've had it. In other news, I read Squawker Jon's Mets entry under protest. You see, The X-Files might be my least favorite TV show ever. David Duchovny is certain my least favorite actor. He's just awful. At any rate, the truth is out there, that if Squawker Jon is going to mention the X-Files, I will be peeved! Didn't have time to write this yesterday, but I'm still a bit irked at Joel Sherman's column from Tuesday's New York Post taking fans to task for complaining too much about the team's problems. I guess he's worried they're stealing his job! After all, this is the writer who wondered after Sunday's game "if a team that relies so much on the long ball could face problems in the postseason when better pitchers are more likely to defy homers." The Yankees had just beaten Red Sox ace Josh Beckett with five homers, and Sherman's trying to find the downside? Sheesh. It's funny, though, how the writer who on Sunday compared the Yankees-Red Sox weekend to October 2004 now suggests that fans overreact! He complained about hearing sports radio callers gripe about A.J. Burnett and Jorge Posada, and about emails regarding "the stupidity of having Joba Chamberlain pitch on such long rest." Well, given Joba's lousy pitching last night, the emailers might have had a point. Posada has had an uneasy relationship with a lot of pitchers and, in general, it was not a detriment to winning. But will Burnett prove as tough-minded as former combatants such as Orlando Hernandez? Or will Burnett let distrust of the catcher-pitcher dynamic impact his results? Guess we know whose side of the argument Sherman is on! After all, he's the writer who admitted to defending Posada in his own clubhouse with the "count the rings" argument when pitchers argued with him. I agree with Sherman that there are times some Yankee fans overreact to perceived problems. But the Posada/Burnett argument isn't one of them. It's a heck of a lot more relevant to this team's October chances than them supposedly hitting too many homers! ...when it comes to the Yankees, the fan base will never be completely at peace until Roy Halladay is the No. 5 starter and the loss column reads "zero." Of course, guys just like me are to blame. We have been Steinbrenner-ized, as well. The given with the Yankees is that they are really good. So my theory, as a columnist, is to examine what would keep them from being great, since greatness is the objective for this franchise. When you cover the Royals, you try to figure out how they get good. When you cover the Yanks, you try to figure out what keeps them from the Canyon of Heroes. See, I disagree with Sherman's whole job description here. Are there times that it's appropriate to worry about this team? Of course - the fact that Joba appears to be backsliding again is one of them. But what's annoying is not when Sherman writes about real flaws on this team, but when he seems to look for stuff to complain about. The thing is, I think Sherman is a really good analyst in a lot of ways. Otherwise I wouldn't waste my time reading him at all. And he also takes people to task who need to be taken to task - like his excellent column slamming Omar Minaya today. Just wish he would keep things in perspective. That's all. Trust no one: A Mets season from "The X-Files"
So the Mets' main return for Billy Wagner is a 26-year-old quadruple-A first baseman-outfielder named Chris Carter. 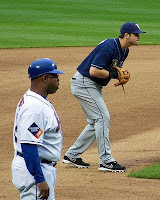 Too bad the Mets didn't get the Chris Carter who created "The X-Files." Because the Mets' season has certainly turned into an X-Files episode. Something paranormal must be going on with this franchise. One of the best "X-Files" episodes was "Clyde Bruckman's Final Repose," starring the late Peter Boyle as a man who could foretell how people would die. The Mets need their own Clyde Bruckman - someone who can foretell how their players' seasons will come to an end. Failing that, I would settle for a GM, manager, pitching coach or trainer who could foretell that their irreplaceable star pitcher might be jeopardizing his health by pitching with a troublesome elbow. How everyone in the Mets hierarchy stood by and watched Johan Santana lose velocity and pitch himself into surgery - now that's an unexplained phenomenon worthy of Mulder and Scully. The truth is out there - time to clean house. David Wright getting beaned, Johan Santana possibly facing surgery, Jeff Francoeur tearing ligaments in his thumb, Jon Niese tearing his hamstring and Alex Cora undergoing thumb surgery - that is a pretty rough year, let alone all that happening in August. And to think the Mets were considered to be unlucky with injuries BEFORE all this. But while bad luck has a lot to do with it, Jerry Manuel's Mets also have a habit of playing injured players and rarely giving regulars days off. Perhaps it is ultimately good luck that the Mets are out of the race. If not, Santana would still be pitching. Let's hope he is getting his elbow checked out in time to avoid the worst-case scenarios. As for Francoeur, it is time to praise Alex Cora again on two fronts. First, for playing through a torn thumb ligament. Second, for shutting it down when he had a second injury and the season was beyond saving. It's great that Francoeur is such a gamer that he wants to keep playing, but if it turns out that he cannot hit well with the bad thumb, then he should make getting healthy for next year the top priority. With Santana likely to be shut down, all of the most highly-rated Mets in fantasy baseball will be out of action. I wrote about that sorry state of affairs for Faster Times. It was so much fun to see our ace CC Sabathia win against Josh Beckett and the Red Sox, and the Yankee offense pound out five homers to win the game and the series. All, that, and we have a new nickname for Kevin Youkilis! 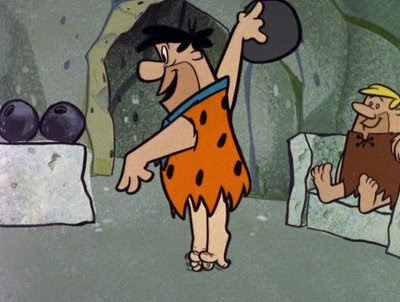 When I was on Twitter during the game last night, I saw Yankee fan/Twitterer Shiney42 write that Youk "reminds me of Fred Flintstone when he bowls. Don't ask --- I have NO idea BUT he just does." I remembered that Fred's nickname was "Twinkletoes" on the show, and wrote that back. Shiney42 responded, "That's it! Twinkletoes - cause of the way he bats on his tippy toes!!" So I'm thinking that unless somebody else has another suggestion, we need to start calling Youk "Twinkletoes." It cracks me up to think of Youkilis as Fred Flintstone! But who's Barney Rubble in this analogy? That's the burning question! "What has he done? Has he pitched this year?" Jonathan Papelbon told WEEI.com. "Is he ready to pitch or is he not? ... I think our bullpen is good where we're at right now. Don't get me wrong. But I guess you could always make it better. It's kind of like the [Eric] Gagne thing, I guess." and 3) Calling out teammates Carlos Beltran and Carlos Delgado for not talking enough to the press. Do I think Wagner will check his ego at the door in Boston? Absolutely not - he's already having his agent make demands before even getting there. Speaking of drama, I think it's time for former catcher Joe Girardi to step in and do something about the Jorge Posada/A.J. Burnett drama. Oh, and by the way, I'm not buying what Girardi said to the media, about how "I have not given anyone a personal catcher." The reality is that he gave CC Sabathia a personal catcher in Jose Molina, but he's loathe to do it with Burnett. In other news, I've written two pieces for The Faster Times site - one on Mike Schmidt's defense of Pete Rose, and another about what happened in Metland yesterday. One other note - Squawker reader Uncle Mike shipped up to Boston this weekend - and lived to tell the tale! See, miracles do happen! Winning a game on an unassisted triple play by a backup infielder who had previously muffed two plays earlier in the inning is the sort of thing the 1969 Miracle Mets used to do on their way to the title. An unlikely hero saving the day in an unlikely way was their specialty. On September 12, 1969, the Mets won both games of a doubleheader in Pittsburgh by a score of 1-0. In both games, the winning pitcher (Jerry Koosman in the first game, Don Cardwell in the second) drove in the only run. It was Koosman's only RBI the whole year. On September 15, Steve Carlton set a record with 19 strikeouts in a nine-inning game, but lost because Ron Swoboda hit two two-run homers. The same Swoboda, not known as a particularly good hitter or fielder, made a miraculous catch to save Game 4 of the World Series. In Game 5 of the World Series, Al Weis, who hit two homers all year and only seven in his career, tied the game with a home run off Baltimore's Dave McNally, a 20-game winner that year. If the Phillies win the World Series again this year, Eric Bruntlett's unassisted triple play will be a prominent highlight. And to think this game began with Shane Victorino giving up on a ball that landed under the outfield wall padding because he thought it was out of play, allowing Angel Pagan to circle the bases for an inside-the-park homer. Victorino's bonehead play suggested that the Mets had a little magic of their own, despite Very Bad Oliver Perez being unable to survive the top of the first. Instead, all that we are left with are reports that Jeff Francoeur will be seeing a hand specialist Monday to see if he did any damage to his thumb on his diving catch. What a year. Read what Lisa has to say about the state of the Mets on The Faster Times. It was great to see the 1969 Mets reunite at Citi Field. But consistent with the odd way the Mets deal with their history, the most memorable part was the appearance of Nolan Ryan in a Met uniform for the first time since one of the most disastrous trades in baseball history. Ryan was still only 24 when he was traded to the Angels in the winter of 1971 for Jim Fregosi, who lasted barely a year and a half with the Mets. But even if Fregosi had made any sort of contribution, it would have been nothing compared to the Hall of Fame career that Ryan would go on to achieve. Imagine if the Mets had two homegrown Hall of Famers who enjoyed the bulk of their success in a Met uniform instead of just Tom Seaver - and at the same time. Jerry Koosman outpitched Seaver in the 1969 World Series and meant so much to that title team that perhaps he should have his number retired as well. It did not seem fair that he was introduced before Ryan, who was not even a rotation regular that year. 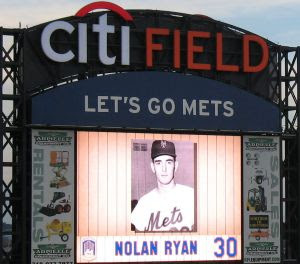 But the return of Ryan after all these years was the big story, and for once, the Mets acknowledged an important part of their history, even if it is a very painful one. Omar Minaya was probably thinking, hey, at least I did not make the Ryan trade. At least Koosman got his due when he, Seaver and Ryan all threw out the first pitch. Then the ceremony came to an end and glorious memories were put aside in favor of the miserable present. There were a lot of Phillie fans there last night, making it seem like a Subway Series game, only one in which one team was already out of contention. At least in our section in the promenade, the Phillie fans were friendly. Phillie Fan 1: If you had to let one of them go, which would you choose - Chase Utley or the Phillie Phanatic? Phillie Fan 2: Wow, that's a tough one. I guess I would have to say Utley. The Phanatic's a Hall of Famer! It must be great to be fans of such a good team that you can afford to jettison a perennial All-Star like Utley for a furry green mascot. Perhaps Utley sensed this debate was taking place, since he soon homered to put the Phillies ahead to stay. As we were leaving the ballpark, I saw a fan wearing a Michael Vick Eagles jersey. That was fast. In three days, there have been two memorable returns - Ryan and Billy Wagner. Sunday, it's Pedro Martinez. All three have mixed legacies as Mets. But the first two just gave us two of the most memorable moments of the season. How will Pedro fare? How will he be received by the crowd? It's psychodrama week at Citi Field! Just about the only downside for the Yankees in Friday night's blowout of the Red Sox was how much it was reminiscent of their Game 3 victory in the 2004 ALCS. The Yankees won that contest 19-8 at Fenway, Hideki Matsui hit two homers and the Yanks took a three-games-to-none lead. At that moment, the Yanks appeared more likely to join a Broadway chorus line en masse than fail to reach the World Series. Their magic number was one with four games to play. But they never did get that victory, and no one ever Cursed again. Yeah, because yesterday's game was so much like Game 4 of the 2004 ALCS. You had the Yankees leading into the ninth yesterday, until Jacoby Ellsbury stole second against Mariano Rivera, and the Sox went on to win on an extra-inning homer from David Ortiz. What's that you say? The Red Sox hit A.J. Burnett hard, for the worst start of his career, and the Sox destroyed the Yankees, 14-1? You mean it wasn't a carbon copy of 2004? Who knew? Sabathia was the highest-paid free-agent pitcher of the offseason and Teixeira the highest-paid position player. In a down economic climate, the Yanks invested $341 million on just those two. They are not going to feel bad about those decisions at 0-1. However, no one wants to make a bad first impression as a Yankee because the hole is always a little deeper, so deep that many never truly escape. Yeah, because Sabathia and Teixeira have been such disappointments as Yankees this year. They could never overcome those horrific Opening Day performances. Sheesh. They entered yesterday leading the Red Sox by 7½ games with one-quarter of the season left. For the record, their magic number was 34. But the most important magic -- it seemed -- was percolating in the Yankees clubhouse. The team's confidence was peaking. They have a cresting sense that they are a special group. After all, blowing a three-games-to-none lead in the postseason is unique. But since 1900, eight teams that trailed by 7½ games or more after the 121-game mark have gone on to finish first, including the 1978 Yankees. * The Yankees have felt that this was a pretty special team for a while now, not just Friday night. * Only Murray Chass seems to think the Sox's season is already over. Besides, even if the Yanks faltered, and the Sox surged, the rest of the way, there still is a pretty good chance that both teams will still make the playoffs (which is why the comparison to 1978 is flawed - we will never have another one game playoff for the Yankees-Sox again, due to the wild card.) So the season wouldn't be over for the Yankees. * The Yankees just pummeled the Sox with an 18-hit barrage two weeks ago, and they ended up sweeping the series. Oh, I guess they were safe from some spooky curse because Hideki Matsui didn't hit two homers in that game. Sheesh. Yet a 14-1 Red Sox rout yesterday provides pause to all the celebrating. Who was celebrating, exactly? Even Sherman notes in his column that Joe Girardi pointed out the season wasn't over yet. Clearly the Yankees are soaring toward the postseason now while doing damage to the Red Sox's October plans. Maybe life could be better in the Yanks' corner of the Bronx. Again, send postcards to explain how. On August 10, the Yanks were sailing towards October in Sherman's world. Now, the sky is falling because of one stinking loss. * A.J. Burnett and Jorge Posada are not on the same page. They'd better work it out, and quickly. Or else Jose Molina ought to be catching Burnett for the rest of the year. * I miss Johnny Damon (!) in left field, and I hope he's healthy enough to play there tonight. * Alfredo Aceves has been terrible as of late. * Kevin Youkilis gets on my last nerve. * Jonathan Papelbon apparently has multiple personality disorder - according to the FOX broadcast, he actually calls himself Cinco Ocho. I wish somebody on the Sox would call him the real nickname he deserves - Cinco Dopo! But I'm certainly not going to read yesterday's loss as like being 2004 all over again. That's just silly. * For a game that the Yankees scored 20 runs in (incidentally, the game had the most total runs for the Yankees-Red Sox ever), I didn't feel confident that the Bombers would hang on until close to the end. * Squawker Jon and Mets fans talk about the Good Ollie and the Bad Ollie Perez. Maybe we should start talking about the Good Bruney and the Bad Bruney. And boy, the Bad Bruney was painful to watch last night! Sergio Mitre didn't make pleasant viewing, either. * How about Hideki Matsui - 7 runs, and 2 homers. He's having a pretty good swan song (no pun intended) for this season as a Yankee. * I heard that even the Sox announcers noticed how much Joe West squeezed the Yankees at the plate! * Happy 70th birthday, Carl Yastrzemski. I wish the Yankees and Red Sox would do some sort of Old Timers' Day with the two teams. I would pay to see it. * I never want to hear about Yankee fans leaving early again, after seeing how empty Fenway Park was last night. * Good news - Joe Buck is not broadcasting the game today. We're still stuck with Tim McCarver, though. * Squawker Jon is going to see the 1969 Mets tribute today. The Wilpons must be asleep at the wheel, actually having a tribute to the team they own, and not the Brooklyn Dodgers! * I wish Fox would bring back the players reading the lineups. That was always fun to watch. There has not been much to cheer about this year in Metland, but at least Billy Wagner made his way back from Tommy John surgery. Good for you, Billy. But will it be good for the Mets? Not if they make a waiver deal with the sole goal of saving money. Sure, there are a lot of zeroes in the money still owed Wagner - $3.7 million - but the Mets have a rare opportunity to add a decent prospect to their barren farm system. Don't blow it! Just the possibility of the Mets dumping Wagner just to save money inspired me to write a column for the Faster Times on whether it is ever acceptable to put your fantasy team ahead of your real team. For the record, I said no, even when what little there is to root for with the Mets these days keeps disappearing. I even came around to rooting for Gary Sheffield before his true colors finally came out. By the way, Lisa, Michael Bowden is one of the Red Sox' top prospects and is on Mack's Mets' wish list of players the Mets could get for Wagner. Yes, the same Michael Bowden who is getting pounded by the Yankees tonight. He really is a good prospect - maybe the Yankees will help the Mets by lowering Bowden's value. Though knowing the Mets, they would probably end up instead with Brad Penny. Programming note: You can read my in-game rants about Yankees-Red Sox this weekend by adding me as a Facebook friend, or checking me out at Twitter. Last time around, I correctly predicted in Facebook and Twitter during the fifteen inning game that A-Rod would hit a walkoff homer. Tonight, I'm predicting that Friday's game will not be a scoreless one! * The Yankees are winning 6-1 as I squawk, so it wouldn't be fair to make a specific prediction for tonight (besides, I would be a jinx in doing so!) I do think the Yankees will win the series, 2 games to 1, and seal up the division. * I also think Kevin Youkilis will end up getting plunked again. And even if it's an accident, I could totally see him losing his temper and starting a brawl. * David Ortiz will hit at least one homer. So will A-Rod. * Mark Teixeira will have an iconic series, and help his MVP chances. * Jonathan Papelbon will be shaky, and then say something stupid in the postgame. * And finally, Squawker Jon will continue to be in despair over the Yankees! One other note - I'm so happy that Jerry Remy is back in action! He's my favorite member of Red Sox Nation. Saw that Jim Rice had the nerve to criticize Derek Jeter, as well as Alex Rodriguez and Manny Ramirez. He's already getting some grief for that! Oh, and by the way, for all the "selfish" adjectives thrown A-Rod's way, he is the one who gave up the chance of going down in history as the greatest shortstop ever to become a Yankee. And Jeter is the guy who refused to play in the WBC unless he started over the superior shortstop, Jimmy Rollins. Just saying. Nor is it breaking news that an old-timer would criticize current players as being not as good as his era. It's only been going on for 100 years or so! So really, considering the source, I don't think that Rice's dopey comments are any big deal. But I'm sure I will be in the minority in thinking that! Squawker Jon isn't the only person to get advice from Razor Shines. In a Faster Times column, I also consulted the Mets third base coach to ask him about the Mets' season, and the Yankees' playoff chances. I even asked him if Derek Jeter is really underrated! His answers are pretty amusing. Oh, and I had to laugh at the fact that Gary Sheffield appears to have thrown the mother of all hissy fits with the Mets. Surprise, surprise, as Gomer Pyle would say. In other news, Peter Abraham reports that Johnny Damon has rented a bus and invited Yankee teammates to go to see a Creed concert with him. Phil Coke, Brian Bruney, Dave Robertson, Eric Hinske, and Kevin Long are among the Yankees going along. I'm wondering what the bus looks like. Is it like the Who's Magic Bus, or the bus in the Beatles' "Magical Mystery Tour"? How about Ken Kesey's "Furthur"? (Come to think of it, the 60s were a big time for buses!) Let's hope the bus doesn't look the way Furthur does now! Coming later today, my highly anticipated predictions for Yankees-Red Sox. But in the meantime, leave us some predictions of your own! I wrote a piece for The Faster Times in response to Joe Posnanski's SI article about how Derek Jeter is underrated. My article is entitled, "Sorry, But Derek Jeter Is Not Underrated." Jeter is having a very good season, but that doesn't make him underrated. Read my reasons why here. Mets' third base coach Razor Shines may be indiscriminate when it comes to sending runners, but that has not stopped him from offering his opinion on, well, everything. Squawker Lisa has alerted me to a promo for Aquafina bottled water in which an interactive Shines answers your yes-or-no questions as the "3rd Base Coach of Life." DO YOU AUTOMATICALLY WAVE EVERY RUNNER HOME? WILL ANY OF THE MET CORE MAKE IT BACK THIS YEAR? Let me consult my muse. (drinks some Aquafina) That's unlikely. ARE YOU DISAPPOINTED THAT THE METS SPENT LESS MONEY THAN EVERY OTHER TEAM ON DRAFT PICKS? Looks like your hitting slump will continue. IS RYAN CHURCH DIFFERENT FROM DAVID WRIGHT? No, quit chasing bad pitches. HAVE YOU EVER TRIED TO WAVE A RUNNER HOME EVEN WHEN NO ONE WAS ON BASE? Relax, just play catch out there. I've been busy with real-life projects (like writing a piece comparing Brett Favre to Cal Ripken) this week, so I haven't had time to write about how Squawker Jon and I went to The Michael Kay Show's remote broadcast at Martell's Tiki Bar in Point Pleasant last Friday. But I was inspired to finally write about our fun day, thanks to Michael Kay being in the news in Yankeeland. Squawker friend Andrew Fletcher of Scott Proctor's Arm was on The Michael Kay show yesterday to discuss his hilarious drinking game inspired by Kay's TV broadcasts. It's a very funny appearance. To his credit, Kay had a sense of humor about the whole thing. Anyhow, Squawker Jon and I went to see The Michael Kay Show in person at Point Pleasant - partly to get a day in the sun, partly to enjoy the delicious clam strips at Martell's, but mostly to see the show itself. We were curious about what they would be like at such an appearance. Would Kay eat a condiment? Would Joey Salvia sing a song? Would Don La Greca switch allegiances and become a Yankee fan? Would our clam strips be good as remembered? The show was done on a stage, with Kay interviewing guests at a table, while he had a band behind him. Joey, of course, sang (several songs, actually). He has a real stage presence. He also gave away copies of his good CD "Long Lost Weekend." Don did not switch over to root for the Yankees, even though Michael offered to get him tickets. It was one of the more amusing things of the afternoon. And while I didn't see Kay eat a condiment, I did (drumroll please) get to meet him and shake his hand. On a personal note, I'm six feet tall, so I'm used to being taller than most people I meet. It was not the case with Kay. He is at least 6 foot 4 or so. I also got to meet Al Leiter, shake his hand, and get his autograph. He's also very tall. Unlike everybody else, who had cards and baseballs ready for him to sign, I just had him sign the back of an ESPN contest entry form! We also saw Ray Lucas and Rick Peterson get interviewed, but we didn't meet them. All in all, we had a very fun day seeing TMKS in person. We got free t-shirts commemorating the day, courtesy of ESPN. And the Martell clam strips were just as tasty as ever. But no, we didn't do any drinking games! Who's more annoying? Brett Tomko or Brett Favre? As if I weren't in a bad enough mood over Monday night's Yankee loss to Brett Tomko (! ), Brett Favre is deciding to unretire. Sheesh. First, the Yanks. What a nightmare Monday's game was. It's one thing to have a stinker of a game like Sunday's, but Monday's was much worse. Brett Tomko seemed to have channeled Carl Pavano's vengeance model. And for the A's to shut out the Yankees in only the Bombers' fourth shutout of the year is just plain wrong. I got angrier as the game went on. Then there's the other Brett getting on my nerves. Please excuse me for this non-baseball rant, but Favre is sucking up all the sports media oxygen right now. He's going to hold the media hostage - again- with the "all Brettt Favre all the time" coverage, now that he's about to be a Minnesota Viking. Talk about somebody who doesn't know when to give it up. And in going to the Vikings, he isn't just burn that bridge with Green Bay - he's napalming it. Aside from the fact that I find Favre overrated (for one thing, he has as many rings as Trent Dilfer does), I also find him completely insufferable. He's as obnoxious and as self-serving as Roger Clemens is. Good grief. It also annoys me how ESPN and others always say his full name. It's never "Favre" or "Brett" but "Brett Favre." Why is that, anyway? Rant over. But who do you find more annoying - Brett Favre or Brett Tomko? Vote in our poll, and leave us a comment! I have not been back to Citi Field since attending the last miserable Subway Series game, featuring K-Rod walking Mariano Rivera with the bases loaded. 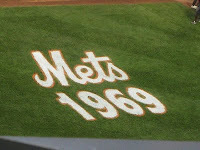 So I have been looking forward to this Saturday, when the Mets honor the 1969 World Champions. But the returning '69 Mets will not be the only visitors that night. So if you'd like to watch the Phils embarrass the Mets further than they've already done themselves – sign up now! I can't begrudge Phillies fans from making the trip to New York to see their team in what at the start of the season looked as if it would be an important game. But what I do not want to see or hear is a disproportionate number of Phillies fans on a night that is meant to honor the Mets. Fortunately, I expect that most Met fans with tickets to the game are likely to attend to see the celebration, so are unlikely to sell their tickets to Phillies fans. It is bad enough that the Phillies are twelve games (and counting) ahead of the Mets. 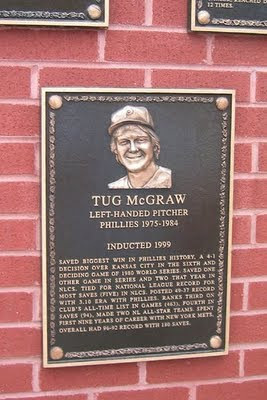 But for Citizens Bank Park to have a Wall of Fame with a plaque honoring MET great Tug McGraw, while there is nothing of the sort at Citi Field - now that is truly intolerable. What is it going to take for ABC to finally pick a baseball player for "Dancing With the Stars"? As I noted in an article for The Faster Times, baseball was snubbed yet again from the competition. I also came up with a list of players who should be on the show - Jonathan Papelbon, Alex Rodriguez, etc. I was wondering if our readers had any thoughts on who should be cast one day on "Dancing With the Stars." Please let us know what you think! Leave us a comment! I miss the days when Met injuries were vague and shrouded in mystery. It is still not clear exactly how Jose Reyes and Carlos Beltran got hurt, much less when they will return. But August has brought Jon Niese writhing on the mound in pain and now David Wright motionless on the ground. At least the Mets actually remembered this time that baseball rules allow a player to be placed on the disabled list as soon as he gets hurt. But as Metstradamus notes, Jerry Manuel's comments on Wright ended up disparaging Ryan Church yet again. All teams have injuries. But most teams eventually see most of their players get back on the field. If there is anything the Mets must figure out from this miserable season, it is how to deal better with injuries. The Mets have a football mentality of playing their players despite injuries. And we see how well that has worked out. It has taken a gruesome injury to the face of the franchise for the team finally to be cautious from the start with one of their stars. When Wright is scheduled to come off of the DL, the Mets, as Metstradamus also points out, will be in Colorado. Presumably, the Mets will not allow Wright to fly to high-altitude Denver, as they did with Church after Church's second concussion. Maybe two weeks of rest is all Wright needs. Let's hope so. And let's hope the Mets become an organization in which we can trust that they will make the best decisions when it comes to the health of their players. Bummer. The Yankees finally have a West Coast game in the afternoon we can all get to watch, and they lose. But at least Derek Jeter set the all-time hits record for a shortstop. That was one of those records I thought Cal Ripken Jr. was the owner of or something. Congrats to Jeter on the record. He is having a very good year this season, and has looked better defensively than he has in a while. In other news, I missed real dollar bills getting thrown at A-Rod Saturday. I'm surprised there wasn't a riot in Seattle trying to grab the money! Check out my piece for The Faster Times about Johnny Macchione, the knuckleheaded Cubs fan who dumped a beer on Shane Victorino's head. I'll have more to say tomorrow, including about Squawker Jon and I meeting some real-life celebrities this weekend. But you'll have to come back and read it. Is Bronson Arroyo auditioning to be a Yankee? I wrote a piece for The Faster Times about Bronson Arroyo's very candid USA Today interview, where he copped to using supplements, andro, and amphetamines. His father even weighed in and said in the article that his son started using supplements at the age of five! Unreal. Hmmm. Arroyo cleared waivers earlier this month. Would I be surprised to see the Yankees try to trade for him as a No. 5 starter, especially given that Chien-Ming Wang could be out for a year? No, I would not. Arroyo has a ridiculous contract. And while I respect his truth-telling, I don't want him as a Yankee. But I wouldn't be surprised if somebody in the Steinbrenner family looks at that quote and thinks that Arroyo would be a great fit for the Yankees. Could he be a better fit as a No. 5 starter than Chad Gaudin or Sergio Mitre? Of course. But he's also owed $11 million next year. Yikes! In other news, how about that Yankee walkoff victory yesterday? No matter what the odds, this team just keeps on coming back! Derek Jeter and Alex Rodriguez both got hit hard - literally - in yesterday's game. Should they have pulled a Youk? Nothing gets Squawker readers agitated like a Red Sox gone wild. So my post on Kevin Youkilis is got a ton of page views, and many comments on both sides of the issue. And 70% of our readers voted "ridiculous" in our poll about him. “I think I could have gotten six, or more [games suspended]. I think the league understands and knows that I’m not the type of player that does that. C'mon now. I get that Youkilis is the kind of player that you love if he's on your team, and hate if he's the opposition. But he also has a really bad temper, and this isn't the first time it's gotten him into trouble. Remember how he got all peeved at Johan Santana? Remember how he even ticked off Manny Ramirez by all of his dramatics? And I don't think Youkilis is evil, either - he's done some great things for charity, including speaking from the heart at a suicide prevention event. But he's awfully annoying, too. And as time goes on, Yankee fans are finding him more and more insufferable. If the Mets were a Broadway show, they would have closed out of town a long time ago. Unfortunately, the Mets can't just shut it down until next year, as their injured stars seem increasingly likely to do. So just like a struggling Broadway show, the Mets are going the discount route. The first show listed, "Next to Normal," could be staged readings of the Mets' unrealistically hopeful injury reports. The Mets might also enjoy being listed alongside "Michael Jackson Tribute: The Harlem Gospel Choir," since both Jackson and the Mets were at the peak of their popularity in the mid-Eighties. Also listed on the Theatermania site is "Strawberry Fields - Featuring Former Members of Beatlemania." Apparently, a tribute to the Beatles will no longer fill the seats - it must now feature people who were in an earlier tribute 30 years ago. Or there could be a different sort of Strawberry Fields tribute show - featuring songs like this one. Kevin Youkilis is rapidly rising up the Most Hated Red Sox chart, if our Yankee fan readers are any indication. And him starting a brawl last night will only add to his rep, such as it is. While Jonathan Papelbon garnered 58% of our readers' votes for the Red Sox they like the least, Youk is in second at 22%. And even David Ortiz getting exposed as a Fenway faker couldn't move more than 6% or our readers to vote against him. What's funny to me is that other players find Youk just as annoying. Manny Ramirez and other Red Sox players couldn't stand his constant temper tantrums in the dugout, and Joba Chamberlain and Youkilis aren't exactly BFFs. The latest player to get tired of Youkilis' act is the Tigers' Rick Porcello, who tossed a charging Youkilis to the ground like a sack of potatoes last night. The great Yankee blog Fack Youk has inducted the Detroit pitcher into their Hall of Fame for this act. I agree! Correct me if I'm wrong, but it looks to me like the Red Sox - as usual - started this fight. They think they can plunk other team's stars and not face any repercussions. 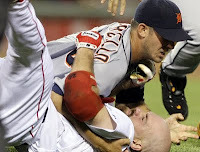 Monday they hit Miguel Cabrera, and Detroit hit Youkilis in retaliation. Then Junichi Tazawa, who has been in the majors for all of five minutes, hit Cabrera again and ended up knocking him out of the game. So when Youkilis got hit again in retaliation, he didn't take kindly to it, throwing his helmet and puffing up like a blowfish. It's sooooo obvious what the Sox are doing here - trying to stir up a brawl to rally around. That's why they went after A-Rod twice on Saturday. They really think that the A-Rod/Varitek brawl turned their 2004 season around, even though they actually went .500 in the week after that fight. No matter. So now it's up to Youkilis to fire up their team. Now they're all pleased that they won. As if they achieved something great. Not so shockingly, when you knock out the other team's starter, you can often beat up on their bullpen. What do they want, a cookie? What kills me is that the Sox have been playing this beanball game for years, but whenever they get retaliated against, like when Dustin Pedroia got plunked for payback about A-Rod getting hit the last time around, they get all hysterical. Dustin threw the mother of all hissy fits the other day, and now Youk is playing the tough guy act. But he sure doesn't look very tough in the above photo from the brawl! As for the Yankees, I missed the game last night - believe it or not, I was at The Bacchae at Shakespeare in the Park - but I'm glad, of course, that the Bombers won. But seeing the Youk video was the highlight of the evening! I find Youkilis extremely annoying, but what do you think? Vote in our latest poll! While the Yankees' four-game sweep of the Red Sox was undoubtedly the highlight of the season so far, don't go polishing the 2009 AL East trophy just yet. Remember how the Mets squandered a 7 game lead in 2007 with 17 games left to play? I sure do - it's one of my favorite things to taunt Squawker Jon about! So having a 6.5 game lead (now 5.5 games) in the middle of August is sweet, but obviously, it's no guarantee the Yankees will win the division. Now that I've gotten the "raining on the victory parade" part of the blog over, let me do a little gloating about this weekend. Whatever happened to the so-called Best Bullpen in Baseball? Or the low risk, high reward signings like John Smoltz? Or John Henry's tweets? Or Dice-K's gyroball? I asked one of our Red Sox fan readers on Facebook if the gyroball was like a snipe! Seeing the Sox get knocked around at the Stadium was great fun. So much fun, in fact, that last night's loss against the Blue Jays didn't bother me at all! In other news, I've written a piece for The Faster Times comparing Alex Rios and Nick Swisher. Turns out, Ken Williams may have been better keeping Swisher, than picking up Rios. One other note - there's only a few hours to vote for your least favorite Red Sox! What should we call this weekend's Yankee sweep? What a weekend! I will have more to say later today about the Yankees' incredible sweep of the Sox. But I've spent all morning writing a piece on Mark Teixeira for The Faster Times. In the meantime, we need to come up with a name for this weekend's series. On Subway Squawkers, we called the 2006 the Boston Glee Party, thanks to Squawker reader Alvaro. What will be the nickname for this year's triumph?Any thoughts? Please post your ideas! Omar Minaya, Mets general manager: Earlier today, a list was leaked that shows the Mets eleven games out in the National League East Division. We are concerned that some in the media may use the presence of the Mets on this list, which was not supposed to be made public, to conclude that the Mets season is over. Michael Weiner, Players' Association general counsel: But we are here today to inform you of the presence of a second list. This list is entitled "National League Wild Card Standings." Unlike the first list, in which the Phillies are generally conceded to be on their way to the division title, there are several teams on the second list that are considered to have a strong chance to win the wild card. Since the Mets also appear on the second list, we believe that gives them plausible deniability that their season is over. Omar Minaya: A local reporter has been writing that the second list shows that the Mets are ten games out in the wild card race and in eighth place. When I saw these stories, I scuffled a bit, because this same reporter has been trying to get a job in the Mets' organization as a statistician. But that is ultimately beside the point. I'm not here to make excuses or anything. I want to assure everyone that the Mets have always done everything possible to stay off of lists. Even when one of our players is injured, we often refuse to put him on the disabled list. Michael Weiner: Given the uncertainties inherent in these lists, we urge the press and the public to use caution in reaching conclusions based on leaks, particularly from sources whose identities are not revealed, that suggest that it is time for the Mets to give up on 2009 and start bringing up prospects. Omar Minaya: I want to apologize to the fans for the distraction, ownership, my manager. This season has been a nightmare for me. I definitely was a little careless back in the offseason when I was signing players like Tim Redding. I never thought that trading for J.J. Putz and Sean Green, it was going to hurt anyone's feelings. And I should have paid more attention to what I was putting in my farm system. "I definitely was a little bit careless back in those days when I was buying supplements and vitamins over the counter," Ortiz said, as if this was somehow a good thing. A person whose livelihood depends on physical activity is so "careless" he doesn't read labels? Doesn't know what's he swallowing? Doesn't even remember whether he took a particular product? Exactly. It defies credulity that Ortiz, who has a personal chef, didn't pay attention to what he was taking. Besides, wouldn't he want to know what worked, and what didn't? And very few people in the media are noting that Ortiz admitted that he was indeed in 2004 about being on the list. So how could he be "blindsided"? And why wouldn't he find out then from the union what he failed the test on, so that he wouldn't take that same stuff again? And, more to the point, whatever "vitamins" and "supplements" he was taking turned him from a mediocrity to MLB's top RBI producer from 2003 to 2007. Yet he wants us to believe he had no idea what he was doing? C'mon now. * Did he ever take HGH? * What about Jerry Remy's son saying that he talked steroids with his personal trainer? * Exactly what supplements and vitamins did Ortiz take back then? * Why isn't he petitioning the government for his test results, to clear his name? * Why did it take nine days for him to talk? All this defense about multiple lists and such were things the union knew six years ago, so that can't be the reason. If the lack of Red Sox in the Mitchell Report didn't make you cynical enough, the fact that MLB and the Players Union issued a joint press release about the steroids test really makes you wonder if everybody is in the tank for Boston. That, and the fact that the union was nowhere to be found when it came to Alex Rodriguez. Right. Most of us routinely inspect all correspondence between the Players Association and Congress. Sorry we missed this one. Despite everything I know and all the lies and denials I've heard players utter over the years, I'm inclined to believe Ortiz, despite the circumstantial evidence tracking his mediocre career in Minnesota to his superstar resurgence with Boston. Here's why: no union officials ever felt the need to sit beside Giambi, Ramirez or Pettitte during their so-called confessionals. Let me get this straight. Ortiz is a player who never hit over 20 home runs in Minnesota, nor drove in 75 RBIs, goes on to average 44 home runs/128 RBIs a year from 2003-2007. But Olson believes him because a guy from a union that is on record as saying that steroids are no worse than cigarettes is at the presser? Good grief. Maybe that was Barry Bonds' mistake - he should have had some slick union dude backing up his "I thought it was flaxseed oil" story. Yankee fans have noted ESPN's anti-Yankee bias for years. This weekend, the same network that had one of their anchors chanting "boli, boli, boli" about A-Rod, thought Ortiz's presser was "genuine." And while A-Rod's PED scandal involved wall-to-wall coverage, the Ortiz story is barely a footnote on ESPN.com today. What's the cliche - no cheering in the press box? Too bad so many in the media can't resist shaking pom-poms when it comes to carrying water for David Ortiz. Let me continue with the predictions, since I'm still basking in the afterglow with my correct A-Rod one tonight. I predict that A-Rod will get plunked today as payback for Dustin Pedroia getting hit on Thursday. And so the Sox can get all fired up, ala 2004. Will a brawl ensue? I wouldn't be suprised. Speaking of which, I wrote a piece for the Faster Times about A-Rod's clutch numbers, which are actually very good this year. Read it here. More on Alex to come, of course. His saga never ends! I just knew that last night's Yankees-Red Sox game would come down to Alex Rodriguez, so I predicted in the ninth inning on Twitter and Facebook that A-Rod would hit a walkoff to win it. True, it took six more innings to happen, but still. I totally called it! What a tremendous game last night. Unlike Squawker Jon's Mets, who seem to be aiming for the worst game of the season each day, the Yankees have had a whole slew of great games this year. I was at the July 1, 2004 game, and last night had a similar "instant classic" feeling to it. Watching A.J. Burnett and Josh Beckett go head to head was tremendous. But tense. Nearly fifteen scoreless innings was nerve-wracking for both sets of fans. Did you know that A-Rod's walkoff homer was his sixth walkoff hit as a Yankee? He has twice as many walkoff hits in 5 1/2 years as a Yankee than Jeter does in his entire career. Yet some fans still act as if this is first big hit as a Yank ever. I don't get it. Heck, he would have had the game-winning hit in the final game in the Yanks' Fenway series in June if the bullpen hadn't blown it. I don't want to forget talking about the pitching. Burnett, Phil Hughes, Mariano Rivera, Alfredo Aceves, Brian Bruney, and Phil Coke were terrific. The biggest surprise, of course was Bruney. Finally he has put it together again! And to top it all off, Francisco Rodriguez blew a save and lost the game for the Mets, and the Yankees have the best record in baseball. Good times! Just saw on Metsblog that the Mets have acquired Jason Dubois from the Cubs. Dubois turned 30 in March and has not played in the majors in four years. He should fit right in. 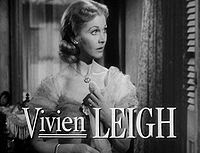 The way the Mets are going, they might as well have traded for Blanche DuBois from "A Streetcar Named Desire." Wikipedia describes Blanche as "a fading but still-attractive Southern belle whose pretensions to virtue and culture only thinly mask alcoholism and delusions of grandeur." "Delusions of Grandeur" could be the title of the Mets' 2009 highlight film. Though this brittle team that can't go down the dugout stairs without missing a week could also be known by the title of another Tennessee Williams play - "The Glass Menagerie." At least last night's game showed that the Mets have not given up trying to add to the "Worst Games of the Year" list. It's one thing for Albert Pujols or Mark Reynolds to beat you with homers. But Everth Cabrera, the light-hitting Padre rookie shortstop who is in the lineup for his speed? And spare me the whining about the umps missing the call in the ninth. With the Mets ahead, 2-1, Kyle Blanks walked and Will Venable doubled into the corner. Blanks tried to the score on the play and was ruled safe at home to tie the game, though he looked out on the replay. After the game, K-Rod said: "A tough one. I don't think he had a good angle. After that, everything fell apart." Wrong, K-Rod. Everything fell apart when you walked the leadoff hitter, a rookie batting .212, and allowed the next hitter, also a rookie, to double into the corner. The Mets had no offense after the first inning. The only bright spot was Oliver Perez pitching well until he ran into trouble in the seventh. If the Mets are going to blame a game like this on the umpires, they really are adopting Blanche DuBois' philosophy - always depending on the kindness of strangers. I wrote a piece for Baseball Reflections on how the Yankees did in July. I thought it was a very successful month, other than the Angels and White Sox series. Go here to read my entire piece. I will be writing for Baseball Reflections once a month. The site features info on all of the teams in MLB. You can check out the whole site here. In addition, Squawker Jon and I are still continuing to write for Heater magazine each week. You can get a $5 discount of a subscription by clicking here. I've been doing tons of Squawking today. I wrote a piece for The Faster Times on why John Smoltz ought to call it a career. Check it out here. I was never a big Mike Mussina fan, but I gained a lot of respect and admiration for him over the way he handled the last year of his career. He left on top with a 20-win season, and left the fans wanting more. What a cool way to go! Are the Mets suffering the curse of Kiti Field? Remember the cat who jumped on the field during the Mets' debut at Citi Field? Did he jinx the team, and are the Mets suffering the curse of the Opening Night Cat? Blogger Ed Leyro wondered about this issue. And I wrote about his theory in a piece for The Faster Times. Check it out here. Sadly, Squawker Jon is a skeptic on the theory, though. As for myself, I'm a believer. Think about it - the Mets razed the feral cats' home at Shea Stadium, and left them out in the cold with the new ballpark. Could I see an angry cat vowing revenge? I say yes! Just look at what's been happening to Luis Castillo, or is that Catstillo? Payback was the operative word in last night's game. The Yankees finally beat - make that pummeled - the Red Sox. A very whiny Dustin Pedroia got plunked in apparent payback for the Red Sox plunking A-Rod at Fenway. And David Ortiz got booed - loudly - as payback for the Sox fans' "You do steroids" chants. But one New York Times writer seems to think that Ortiz didn't get booed loudly at all. George Vecsey, who admits that he spent years saying "Got proof?" to fans emailing him that Ortiz was a juicer, and now claims that Ortiz's positive PED test is "unofficial"and somehow does "not count" in the scheme of things, seems to be just as myopic over Big Papi's reception at last night's game. But on this day of Sotomayor’s confirmation and Ali’s visit, Big Papi did not stir up much anger, or even make-believe anger. Big Papi made a pro-active strike, bellying up to the rail to sign autographs and pose for photographs with fans in Red Sox gear or striped Yankee jerseys. Classic Big Papi, the man of the people. Hard to boo a fellow like that, or even stick out the tongue between the lips and make the razzing sound long associated with the Bronx. Vecsey also called Ortiz either "Big Papi" or "Papi" an incredible eleven times in the article. Put down your red pom-poms, dude. Big Papi did hear some boos at 7:17 p.m. when he batted with two men on and two outs, but it pretty much died out before he dug in his spikes. When the Red Sox starting lineup was announced, it was as though everyone in the joint was waiting, just waiting, for one name. The booing he received during introductions turned out to be a mere appetizer for what happened in the first inning, when, with runners on first and second, two down, Ortiz came up to face Yankees starter Joba Chamberlain. The booing started even before Ortiz’ name was announced, and it continued throughout the at-bat, which ended with a fly out to right. Ortiz finished the game 0-for-5 as the Red Sox lost, 13-6. Once he walked to the plate and kicked dirt off of his spikes, the crowd hurled loud, extended boos at him. One fan along the left-field foul line held up a white placard with a thick, black asterisk. So much for Vecsey's assertion that the boos were not very vociferous, and "pretty much died out before he dug in his spikes," eh? It's one thing for him to have opinions - he's a columnist, after all, and having opinions about sports are pretty much his job description. It's another thing for him to ignore or minimize what really happened to Ortiz at last night's game in order to make his point that fans don't really care about cheating. When Ortiz’s name was announced in the first inning, he was heavily booed. One Yankees fan held up a sign that said, “Roid Sox,” and another waved a sign with an “asterisk” on it. There was another interesting scene as a man wearing an Alex Rodriguez jersey stood, cupped his hands around his mouth and aggressively booed Ortiz. Rodriguez acknowledged in February that he had used steroids. In his previous piece on Ortiz, Vecsey asserted that the New York Times' partial ownership of the Red Sox did not affect the paper's coverage of the team. If we are to take his word for it that it doesn't, then it just means that Vecsey writes about the Red Sox like a gushing fanboy all on his own. Good grief. The Mets have scored 32 runs in the last five games. But they have lost three of those games, since they have given up 29 runs. What a season. Squawker Lisa and I both have columns now on The Faster Times. Lisa has MLB and I have fantasy baseball. The Mets have not been very inspirational lately, but they did inspire me to write about how you can no longer assume your fantasy pitcher will do well at Citi Field. Lisa, I see you have predicted that Clay Buchholz will have a good game this weekend. Here's my prediction - I cut him this week in one of my leagues. And as for your prediction that I will end the weekend in despair - how could that be, now that the Mets have reacquired Anderson Hernandez! Drum roll please...it's time for me to make my Yankees-Red Sox series predictions. Let's hope there are no "Price Is Right" sad horn tones in my future. ^ Game 1: John Smoltz vs. Joba Chamberlain: Smoltz is 100 years old, while Joba is young, healthy, and finally seems to have gotten it together. Advantage - Yankees. * A-Rod will end the home run drought - he's gone 61 at-bats without a homer, the longest drought in his Yankee career. * David Ortiz will dodge the steroid question a few days, then be lawyered up when he does finally talk, and say close to nothing. He'll give some excuse of an obscure supplement that just happened to cause a positive test results. Oh, and the booing for Ortiz, especially the first at-bat tonight, will make the Yankee fans' booing of Carl Pavano look like a lovefest! * We'll see the biggest, loudest crowds we've seen at Yankee Stadium this year. I noticed on StubHub that there were only a few hundred tickets left today. Last time the Sox were in the Bronx, tickets were available below face value. This week - not so much. * And finally, if the Yanks win the series, Squawker Jon will be in despair. That's not a prediction, that's a promise! What are your prediction? Leave us a comment! The day the David Ortiz steroids story broke, I mocked him on The Faster Times for his claims that he would investigate what he tested positive for. I called him "Sherlock Ortiz." Can You Believe That Alex Rodriguez Handled This 1,000 Times Better Than You? Here's the thing with A-Rod. However goofy he sounded, he communicated some remorse, and explained a heck of a lot more than anybody else has so far. As it turned out, he actually did handle this okay. Meanwhile, Ortiz is still claiming he doesn't know what he tested positive for. Gimme a break. And get this. Today John Henry finally spoke - a little - about this! Wonder if he will go back to Twitter now? As for the Newsday article feauring me, I found a newsstand on Staten Island selling the paper, and bought out their supply. It was only two newspapers, but still! Oh, and Squawker reader Paul from Boston noted that Davidoff's piece was republished on the Boston Herald web site. So I am being read in Red Sox Nation. Check out that link here. Coming later today, my predictions for Yankees-Red Sox. But in the meantime, please leave us a comment! Whoo-hoo! I got quoted in today's Newsday! Stop the presses! Newsday columnist Ken Davidoff interviewed me in his column in today's Newsday. Check it out here. He asked me about the rivalry, and what Yankee fans' reactions would be to Ortiz. I wrote about this subject for the Faster Times last week, and elaborated on it in the interview. Anyhow, the best part of the piece is that Davidoff wrote the words, "I think Swan is right"! I told Jon I'm going to remind him of that quote every time we argue on something. It could be like a movie blurb! Davidoff is a great writer who also does a daily blog on baseball. In case you haven't been able to find that blog thanks to Newsday's redesign, go here. Thanks very much to Ken for writing about me in Newsday! "The Greatest Game" writer Richard Bradley linked to Davidoff's piece in his own blog, "Shots in the Dark." Bradley also wrote some terrific analysis on the calculation behind Ortiz. Check it out here. At some point during a football game, a player on your team is likely to get hurt. Maybe he will limp off the field on his own. Maybe he will have to be helped off by fellow players and the medical staff. Maybe he will need the cart. If it looks serious, fans will first be hushed, then cheer their fallen player as he is carted off. In many cities, they will cheer a fallen opponent as well (in Philadelphia, not so much). We are used to this in football. Even a player being immobilized on the cart is not as shocking as it once was, especially since, thankfully, the player is often able to give a thumbs up as he leaves the field. But I am not able to get used to injuries in every baseball game. Maybe it is just bad luck. Maybe it really is some sort of curse. But whatever it is, the Mets have to step back and take an objective look at training methods and handling of injuries. After Jon Niese got hurt, he was able to stay on his feet and attempt a warmup pitch. And then he collapsed to the ground in agony with a complete hamstring tear. I am not a doctor or a trainer and have no idea how the warmup pitch affected the initial injury. But the Mets have a bad tendency to minimize injuries. They delay putting players on the DL in hopes that they can come back quickly. On another team, letting an injured player throw a warmup pitch would seem like the natural thing to do. And it probably was. But it would be nice to be confident that the Mets' medical staff was making the best decisions for the players, and the way things have gone this year, it is hard to have that confidence. Is that your final answer, Nelson Figueroa? Yay! Melky Cabrera hits for the cycle!